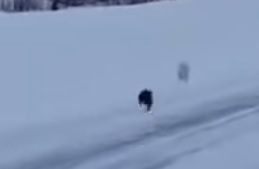 This isn’t exactly a wildlife fight video–okay, it isn’t at all. It shows a marten that appears to be very dedicated to this particular meal consisting of rabbit. It’s always interesting to see videos like this, as it isn’t that common to witness this, and, sometimes, animals can surprise you.